Even as Gendo plots to submit his entire staff to aerobics training, the sinister SEELE has sent Kaworu Nagisa to sabotage Gendo and Yui's more private objectives... which means he's soon enrolling in Shinji's class! 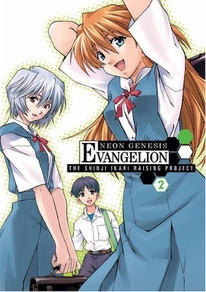 Such a pretty boy starts turning heads inside homeroom 2-A - even Shinji's - which causes Rei and Asuka to agree to join forces, on the grounds that Kaworu's presence could cause trouble for NERV. The irony is that, even if that's just their excuse - they're right!